Venture to the park or the beach on a sunny day and you will invariably see people throwing flying discs to one another or perhaps, to a speeding canine. Many people are under the false impression that flying discs are hard to throw. Nothing could be further from the truth. As with any endeavor, the most difficult part is getting started in the first place. Learning to throw a flying disc is not difficult — but throwing well requires lots of practice. But you’re in luck, because your canine will chase and retrieve your bad throws with great enthusiasm. Before getting started, be sure to select a disc that is right for you and your canine. Frequently, beginning canine disc enthusiasts will attempt to use a flying disc of inferior quality, a disc that is too large, or a disc that is unsuitable for canine play. Hyperflite discs were designed to have predictable and consistent flying characteristics and to fit the hand of the thrower. Hyperflite's patent-pending “grip strips” fall readily to hand and make gripping the disc a breeze. There is some technique involved in throwing a disc properly, but once you have mastered the basic skills, then the sky is the limit. Before long you will want to add some exciting trick throws to your repertoire. Learning to throw a flying disc well is not only fun for you and your dog, but it will make you look like a pro at the beach, too! Before beginning your disc dog training, you need to obtain a disc that is suitable for canine play. Hyperflite has developed its K-10 line of flying discs exclusively for canine use. All Hyperflite K-10 discs feature patented, opposed grip strips that are designed to help a thrower maintain a good grip on the disc even when it becomes lubricated with the usual complement of dog slobber. In addition, all Hyperflite K-10 discs feature Hyperflite's revolutionary patent-pending X-Flash™ anti-glare technology. X-Flash™ was developed to address the sunflash problem. A sunflash occurs when sunlight is reflected off the glossy surface of a canine disc, into the eyes of a pursuing canine. A missed catch is the usual consequence of a sunflash encounter. X-Flash™ was designed to make sunflash a non-issue and it’s featured exclusively on all Hyperflite canine discs. Every disc in the K-10 line was developed with the canine in mind and intended to address a specific need. For example, Hyperflite’s Jawz disc, the world’s toughest canine disc, is designed to withstand the gnashing of canine teeth. The SofFlite disc, on the other hand, is extremely soft and flexible for canines with sensitive mouths. Hyperflite's Frostbite remains flexible in cold weather and does not shatter even in extremely cold conditions. Hyperflite's Pup™ discs were the first canine discs designed for small dogs and they fly just as well (and nearly as far!) as full-sized Hyperflite discs. All Hyperflite K-10 discs fly similarly, and once you learn to throw one, you can throw them all. Hyperflite K-10 discs have been selected as the official discs of the Skyhoundz World Canine Disc Championship Series, the largest canine disc competition series in the world. Starting with the right flying disc will greatly shorten the learning curve and speed you on your way to an enjoyable and fun activity for both you and your pet. And if you apply the tips and techniques discussed below, and practice regularly, you will become a proficient thrower in no time at all. 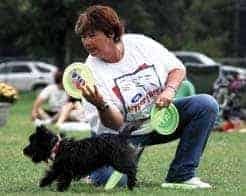 Learning to throw a flying disc properly is critical to your success in canine disc competitions as well as to your pet's safety. No matter how good your dog is, if you continually make wild or unpredictable throws, it will be difficult for your four-legged friend to make consistent, safe catches. Therefore, when training, make learning to throw well your highest priority. If your canine has never before had an encounter with a flying disc, it will be important to introduce the disc to him in a non-threatening way. One way to accomplish this is to use the disc as a food or water dish before you begin your canine disc training. Because all Hyperflite discs are made with food-safe polymers and inks, it is safe to use your Hyperflite disc as your dog's food or water bowl. Once acquainted with the disc, your canine will now be ready to discover that his food dish is also a great toy. Begin by getting down to your dog's level. With excitement in your voice, move the disc rapidly back and forth and let your dog try and grab the disc. Once you have your dog's attention, slide (inverted discs are easier to pick up) or roll the disc across the ground to develop your dog’s tracking skills. If your dog chases the disc, even if only for a few feet, remember to be liberal with praise for the effort. Canines are eager to please and will respond much more quickly if they think that you are happy with their efforts. Next, encourage your dog to take the disc out of your hand. This can be accomplished with the disc right side-up or upside-down. Do not pull the disc away from your dog once he takes it from you. Instead let him have it as a reward for his efforts while you simultaneously reward him with praise. Use a firm (but not tight) grip to hold the flying disc. Your fingers should fall readily to the grip strips on the top and underside of your Hyperflite disc. After you develop a comfortable grip, practice it repeatedly until it becomes second nature. As in golf and tennis, a proper grip is key to success. When starting out, make short throws and keep the disc's flight as flat as possible. The disc will react differently if released angled nose up or down, or angled side-to-side. Until you become more skilled, it is best to practice when the winds are calm. If you do practice in the wind, try to throw across the wind, not downwind or upwind. Once you become a proficient thrower, you may choose to throw into the wind for extra float time or with the wind at your back for longer distances. At first, practice only short-range throws (10 or 15 yards). Gradually increase the distance of your throws as you gain proficiency. There are many ways to throw a flying disc but the most common and versatile throw is the “backhand” throw. The backhand throw is an easy-to-learn delivery that works equally well for short or long throws. To make the backhand throw, use a firm (but not tight) grip to hold the flying disc. For the proper grip, make a fist with your palm up, open your thumb to the hitchhiking position. Loosen your fingers just enough to slip the disc between your palm and finger tips and place your thumb on the top-side grip strip of your Hyperflite disc – just as you might hold a dinner plate if you were holding it upside down. Avoid placing your index finger along the outside edge of the disc, as this type of grip will not enable you to make accurate throws over longer distances. Instead loosely rest the disc on the first joint of your index finger. With your Hyperflite disc at the ready, stand with your feet a shoulder's width apart with your knees slightly bent and parallel to each other. Essentially, this stance is similar to a stance that a golfer would use to address a golf ball. Your forward shoulder should point toward the intended recipient of your throws or in the direction of the intended flight of your disc. Start with two-thirds of your weight on your back foot. Then shift your weight forward to your front foot (leaving one-third of your weight on your back foot) as you transition through the throwing motion and release the disc. Do not lift your back foot off the ground and lunge forward! Instead keep some weight on each foot. Follow through with your release hand pointing at your target. If your throw goes to the left of the target, you've released it too soon; to the right, too late. When throwing a disc it is important to make sure that the proper amount of spin is imparted to the disc during the throwing motion. Spin provides stability to the disc in flight. At first, beginners can simply concentrate on wrist snap. Ideally, however, spin is imparted to a disc through several factors, including proper body position and a throwing motion that originates from a steady stance and progresses through the hips, arm, elbow and finally, the wrist. If you have ever been fortunate enough to be entertained by a world-class canine disc team at an NFL halftime or other sporting event, then you know it takes a lot of practice to put on a show that will keep 60,000 people glued to their seats in amazement. A seasoned canine disc team performing before a roaring crowd is truly a wonder of fluidity, choreography, athletic talent and pure energy. It all starts with a great dog and a lot of practice. If you don't already have a dog, be sure to consider your personal circumstances and living arrangements beforehand. If you are off to college or living in an apartment, it may be difficult to find housing that will accommodate you and your pet. When searching for a canine, consider visiting your local animal shelter. Animal shelter mutts make great companions and wonderful disc dogs. In fact, more than half of the World Champions in canine disc sports have been mixed-breed dogs. In choosing your pet, make sure that he or she is healthy, lively, friendly and energetic. Don't assume that popular disc dog breeds such as border collies and Aussies are right for you. 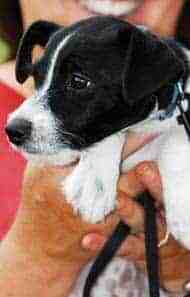 These dogs can be demanding of your time, as they require a great deal of exercise and attention. If you ignore their needs, they can find ways to entertain themselves, perhaps by shredding your favorite shoes or that new sofa! If purebred dogs suit your fancy, be sure to research your breeds of interest thoroughly at your public library or local bookstore. The information available should inform you of any health issues or activity-related concerns applicable to a particular breed. Since it is imperative that your dog be healthy before attempting any strenuous disc activity, check with your veterinarian before starting out. Have your pet examined regularly. Keep your dog de-wormed, heartworm free and current on all of his immunizations (such as rabies, parvo, kennel cough, etc). Remember, your dog can't tell you if he isn't feeling well, so you must develop the ability to assess his physical and mental condition. Learn to be observant. Notice whether or not your dog is eating properly; check his stools for any unusual discharges or parasites; check for broken nails or tooth damage, etc. When in doubt about your pet's health, always consult your veterinarian. A healthy canine will be a happy canine. Once your dog is consistently taking the disc out of your hand, kneel down and position your canine in front of you about three feet away. Instead of handing him the disc, say, “catch” and gently toss the disc in the air just in front of your dog. Never throw directly at your canine. Always let the canine move to the disc. If your dog moves toward the disc and attempts to catch it, give him lots of praise. Since you want the catch to be the reward, don't let him pick the disc up off the ground if he doesn’t catch it. Repeat this exercise until he catches the disc consistently. Also, make sure that you are releasing the disc at a catchable angle, so the disc's edge is easy for him to grab. Next, position your dog to your left side (if you are right handed) and make a short throw (less than five yards) into the wind. As your dog's catching consistency improves, you can advance to longer throws. It is a good idea to make all your throws into the wind so the disc will fly slowly and float long enough for your dog to make a mid-air catch. Once your dog has learned to catch the disc and can make mid-air catches, you may wish to explore the exciting world of canine disc competition. Many enthusiasts choose to put together a freestyle routine to keep things interesting for their canines. Putting together a Freestyle routine involves the use of more than one disc thrown sequentially and combined with a variety of catches and other assorted tricks. As you develop a Freestyle routine, try including a combination of short, medium and long throws. You might also attempt multiples – tricks in which several discs are thrown, in rapid succession, to a dog. For great exposure to advanced maneuvers attend a Skyhoundz competition. The Skyhoundz Series, sponsored by Hyperflite, consists of more than 100 disc dog competitions around the world. These events offer you the opportunity to view other dog/owner teams in action, while giving you ideas for tricks to teach your dog. In developing a routine, you should begin by writing down all the moves and sequences that your dog has learned. Then, build a routine from one throw and trick to the next making sure your transitions are smooth. Also, mix up your tricks, create combinations and avoid repeating tricks if possible. Break your routine down into thirds to make practicing, as well as remembering your routine, easier. Finally, make sure that you develop a routine that showcases your dog's abilities and don't forget to have fun! And don't worry if Freestyle intimidates you, because there is a lot more going on in the competition scene than that. In fact, the Skyhoundz Series also includes exciting events like Bullseye, TimeTrial, Distance Accuracy, Spot Landing, Pairs Distance/Accuracy, and Xtreme Distance! There are even special classes for smaller canines and a Women's Division in the Xtreme Distance Series. In short, there is something for everyone if you decide to move beyond the backyard. Canine Disc Titles can also be earned at all Skyhoundz competitions including Local Championships, State Championships, DiscDogathon Qualifiers, Xtreme Distance Qualifiers, Regional Qualifiers, Open Qualifiers, International Qualifiers, the European Championship, and the World Championship. For more training information, download your free copy of Disc Dogs Rock!. For advanced disc dog training aids including, Disc Dogs! Training DVD or Disc Dogs! The Complete Guide, visit the Skyhoundz store.